just with a different selected file. Any ideas how to fix/handle this? Thanks. Downloaded it directly from the site. Also, if I pick the file you say I get a Game Error  dialog. However, the strArgs should not be empty in any case. There are many required arguments involved when launching the client. Nothing at all is not an option. It's either a display error or something much worse. I have a copy of Mojave on my work machine. I could try it out. For science. 1) I downloaded the ddolive dmg and it opened the installer disk for me. 2) I dragged the application to the applications alias on the installer disk. 5) It warned me that its a 32 bit app and will no longer work in macOS 10.15 due this fall. It asked me if I wanted to run the unverified app downloaded from the Internet. It asked me if I wanted the high res files. (I said yes to that). It forced me to install the Akamai file share thing. 6) It proceeded to download 12 GB of files. Progress was displayed in the Launcher as it did this. 7) However, it appears to have made enough progress to move on. 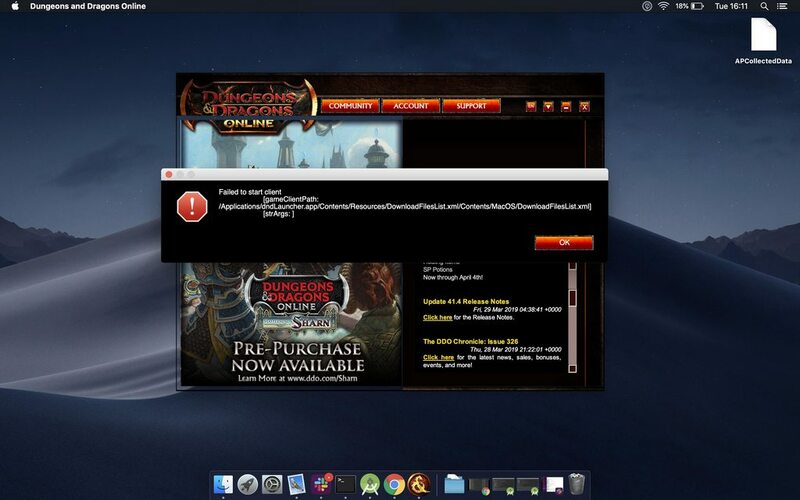 After relaunching, it proceeded to download the latest Launcher patches which went quickly. About 17 MB and the Launcher relaunched then it downloaded those ridiculous splash screens. 8) Then it downloaded 7731 patch files. Maybe this was the same set of files as earlier, it took as long or longer, but the progress display in the Launcher looked different. The actual file sizes involved were illegible, but it steadily progressed. 11) And then I was asked to select a file. Just like you! Well I had too much time to write all this, but I landed in the same place as you. I do note that the only thing selecting a file is doing is trying to launch it like an app. That is not accomplishing anything. I am going to try the launcher script I use next. The launcher script works. I can't believe how hard I made it to use that though :-) I am going to clean it up. account=account_username_here # Main account username. No spaces anywhere. pass=account_password_here # Main account password. No spaces anywhere. selectedServer=server_name_here # Main server name e.g. Orien. Capitalize the first letter! If you get it all right, you can drop the file into a Terminal window and launch the game. It skips the Launcher altogether and goes straight to the character screen. Plus it skips all those annoying download screens. Nevertheless this is a terrible problem. The Mac launcher is just flat out broken for new users in Mojave. SSG should probably look into that. Last edited by Kaytis; 04-04-2019 at 11:31 PM. I had the same issue until I downloaded the Steam version. Dunno what the difference is, but it runs exponentially better than SSG’s download version...even without Steam running. Also, without steam running, you don’t need to deal with the Steam store. So it took a while for me to try the launcher script but it actually worked, I did get some crashes at first but it turns out that I was missing some updates and after downloading them it all worked fine, thanks a lot for your help!